On Thursday, open innovation scholars enjoyed a very exuberant 1st day at the 1st annual World Open Innovation Conference in Napa. The conference opened with Henry Chesbrough , summarizing the evolution of the OI concept from his 2003 book. He noted that when the book came out in April 2003, a google of "open innovation” produced 200 hits; exactly 10 years later, it was 450 million. He also addressed some of the criticism of OI, including the "old wine in new bottles" one. One of his most photographed slides listed the 8 points of how OI is different from his (oft-cited) Chapter 1 of the 2006 book. Outside in (outbound) mode — which is both less practiced and (as documented in Bogers & West 2014) less studied. Chesbrough next introduced David Teece, author of two seminal articles related to innovation strategy: Teece (1986) — profiting from innovation — and Teece et al (1997) — dynamic capabilities. He sees OI as tied to the sensing, seizing and transforming framework of dynamic capabilities. Sohyeong Kim (a postdoc at Berkeley with Henry) led a session on “open oenology,” where the audience broke into groups to brainstorm solutions to improve the future revenue streams of the wine industry. Some of the ideas were a little wacky — vitamin-infused wine — but it seemed as though people were having fun coming up with innovative ideas. As promised, the slides have been uploaded to SlideShare. After that plenary, we had a great session of 11 posters over wine (and a little bit of beer). The discussions seemed quite lively — even before the attendees had earned their drink tickets by providing feedback — but the discussion level rose by 5-6 decibels after everyone had a drink in their hand. I am hoping to upload all the photos (as I did at the London 2012 conference), but right now the Picasa client is not cooperating so I will need to spend more time figuring out a workaround to Google’s attempts at lock-in. “No other innovation conference has gathered so much talent from both industry and academia at the same time in the same place,” Chesbrough said. Based on their initial reviews, these papers (and nine others) are also invited to participate in the ICC special section. One important difference from most innovation conferences is the involvement of industry professionals throughout the conference. This includes both keynote sessions, a solution-seeking workshop, a session on industry OI experiences, and a session on OI in the wine industry. After worrying if we could fill the Silverado Resort, the conference is sold out — with 120 attendees (the room capacity) and a waiting list of would-be attendees being turned away. Given the interest, I think it's safe to say there will be other WOIC conferences in the future. On behalf of the conference chairs — Chris Tucci, Frank Piller, Henry Chesbrough and Joel West — we look forward to welcoming these 100+ attendees to California and an intense (and hopefully enjoyable) forum for discussing open innovation. Update Nov 26: Upload and link the revised program released Wednesday. After several meetings by the co-chairs and hundreds of reviews, the acceptance decisions have been made for the World Open Innovation Conference 2014. Authors have been notified and people can start making their plane and hotel reservations. 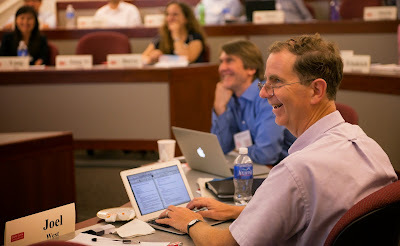 The program chairs — Chesbrough, Piller, Tucci and West — were overwhelmed with the interest in our inaugural conference. We received 115 submissions, and will probably end up (after attrition) with about 55-60 plenary, parallel and interactive papers. We were limited both by the size of the venue and a desire to keep attendance around 100 people. Being the first US-based open innovation research conference, we were unable to predict the mix of papers. There will be crowdsourcing papers, but not as many as at OUI 2014. Not surprisingly, the Chesbrough conference will have more patents than the von Hippel one, but not dramatically so. If anything, the difference seem most pronounced in the two sessions worth of business model papers. 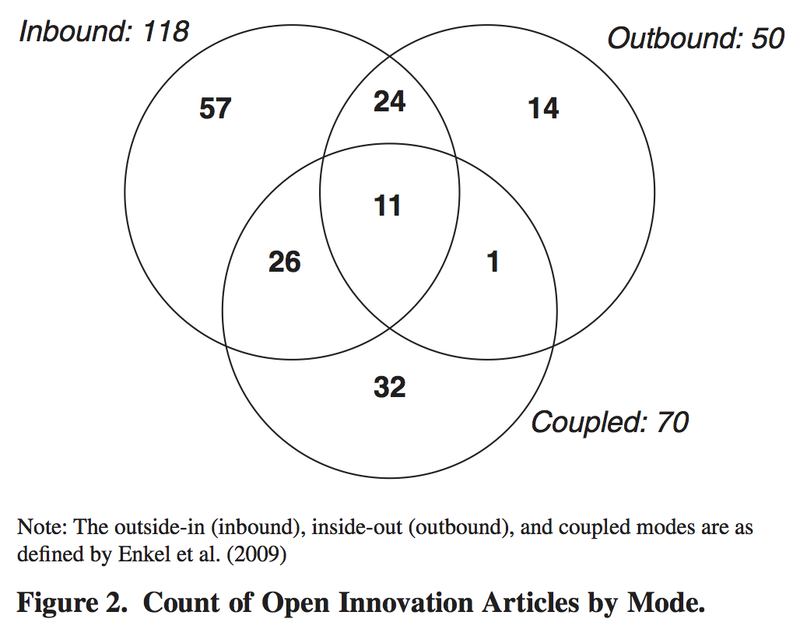 (As Marcel and I noted in our June 2014 JPIM, business models are an important part of the concept of open innovation, but relatively under-researched). The program will include a new interactive paper format, combining the plenary intro pitch of OUI with the posters+drinks approach that worked so well at our 2012 London conference and this year’s OCIS social at AOM. I even had one author volunteer to give up a parallel paper presentation slot to do an interactive paper (which we nixed because the process would be a nightmare to administer). When we did the London conference, we expected to get more authors from Europe than the U.S. In planning for WOIC, we worried that not enough of them would come to a resort 90 minutes from San Francisco’s international airport. We needn't have worried. In other words, there will be nearly as many Germans (population 80 million) presenting in the US as there are Americans (population 315 million). So perhaps there will be less German spoken at the Chesbrough-Fest (a medieval English name) than the VonHippel-Fest (honoring the son of a German-born physicist). But clearly German will be the 2nd most popular language at coffee breaks. Given the travel costs, I expected more chaired professors, but that didn’t happen. Instead, about half of the names are familiar OI researchers (including 6 of the 19 accepted authors from the June 2014 special issue of Research Policy and 3/4 of the guest editors). Some of the other names are their students and other co-authors, but there are definitely names that I haven’t seen at an open innovation conference before (not to imply that I’ve been to every meaningful OI conference). We made our decisions off of abstracts, which sped the review process but at times made it difficult to judge the substance of the paper. (Some authors did a better job than others of squeezing their key points into a 3,000 word abstract). Some conferences accept based on "I promise to write this paper", but — with so many strong submissions — many such abstracts didn’t survive in competition with completed research. No need to include an abstract within your abstract. The lit review needs to be drastically shortened — as in a real paper (or a PPT deck) it should be no more than 25% of the body of the paper. Make sure your abstract communicates your contribution, not tells us what you hope your contribution will be someday. (If you don’t know yet, take your best guess — it will be better than ours). Use as many words as you need to prove your point. What is your evidence? What are your methods? Measures? Make the link to the conference theme explicit, as many papers were rejected for failing to do notice that this is a conference about “open innovation” (as defined by the CFP). That said, the paper will be accepted based on its potential contribution, not on its fit to the conference. Don’t claim “there’s no theory in open innovation” and promise to be the first one to solve this problem. (NB: unless you’ve read every single article, it’s probably dangerous to claim to be the first to do anything in any research stream that’s 10+ years old). Faced with an unexpected surge of demand, we instituted a “Rule of One” comparable to OUI or DRUID: one attendee, one paper. As with both conferences, some senior authors were listed on multiple papers with their students but only present one paper. In the end, the Rule of One only affected one person (me) who had an under-funded lead author who can’t fly from Europe in December to present his paper (forcing me to drop it or another paper where I’m lead author). We expect to have a great two days (December 4-5) in Napa. The size seems just right — what OUI used to be, but slightly bigger than our wonderful 2012 London conference. I hope that the Silverado Resort will have the same effect as my former hangout in Hawaii (HICSS): people will be happy to be there, and thus more relaxed (and hopefully creative and constructive) in their interactions. I suspect we will have more spouses than usual, allowing allowing people to put faces to names they have heard about for years. In addition to having a nice venue, we also have the Napa Valley. After the conference ends, there will be an (optional) wine tour and other outings available. For people whose papers weren’t done this year, there’s always next year: like a fine wine, good research should not be served before its time. We are hoping that by having a regular conference (December) and submission deadline (July 1), people will be able to plan to have something available for this annual event. I’m now home after 3 conferences and 2 weeks on the East Coast. During the trip, much of my time — and all of my speaking roles — was spent talking about networks, communities, ecosystems and platforms. Maybe I’m getting crotchety in my old age, but it seems like there’s some sloppiness in the use of these terms by innovation scholars. Since this is my main area of research — both for the past decade and probably another decade to come — I’d like to summarize some of my thoughts on these constructs, with pointers to the literature. My own paper attempted to map the platform concept onto my current employer’s interests: as Kevin Boudreau kindly told me last weekend, if you send a platform guy to a biotech institute then interesting things will happen. He tweeted the (very rough) conference paper to his followers, but I hope to have a much better version at a journal Real Soon Now. Perhaps the most insight I got during the two weeks — certainly on platforms — came from the comments of Carliss Baldwin. The first was during QA on my paper at BU, the second was as the formal discussant for a AOM 2014 session on platforms featuring research Gawer, Liz Altman and others. If you ever want to learn what platforms are really about, be in the room when Baldwin is speaking — she cuts to the heart of the matter with an insight and clarity that are almost never found in academic journals..
At AOM, I had two key opportunities to discuss communities. One was in presenting my own (conditionally accepted) study of consumer 3D printing, written with George Kuk. The 3D printing world looks like the open source hardware communities of Raasch et al (2009), which in turn look a lot (but not exactly) like open source software communities. The other was kicking off a great communities panel at AOM with papers by Georg von Krogh, Karim Lakhani, Christina Raasch and Sonali Shah (irreverent discussion by Chris Tucci). 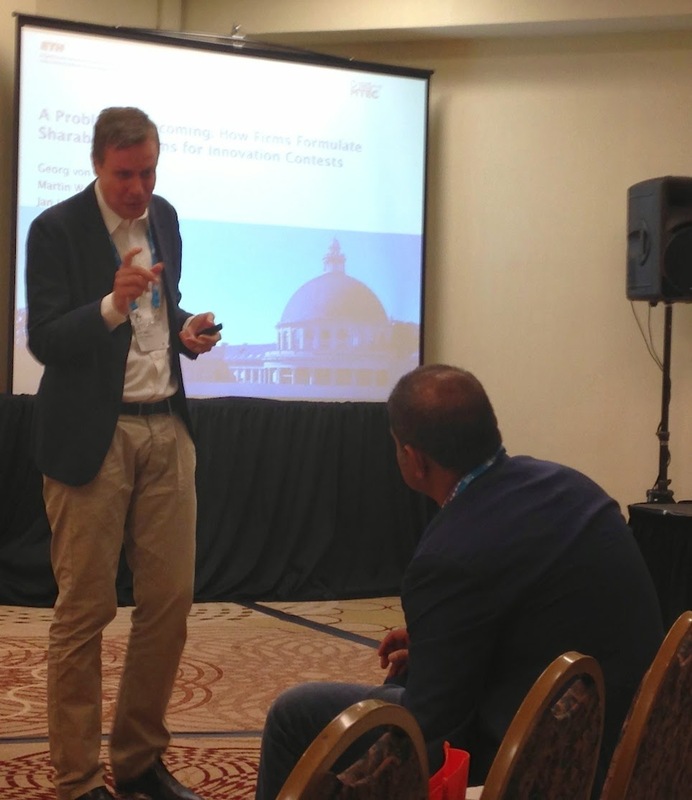 In a session hosted by Jonathan Sims, we focused on how firms work with communities, i.e. the open innovation application of communities. For this, I recommend Lakhani’s conceptual work. Lakhani is mainly known nowadays for his empirical work on crowd sourcing and other communities and platforms — frequently co-authored with Boudreau. But (IMHO) it is two lesser known conceptual papers by Lakhani that best cover firms and communities. The first of Karim’s conceptual papers is West & Lakhani (2008). It was published in the Dahlander et al (2008) special issue of Industry and Innovation, which in turn was based on a 2007 EURAM conference track on firms and online communities. The Dahlander et al intro article is currently listed as the “most read” article published by the journal, while W&L is listed sixth on its “most cited” list. (According to a 2009 study, this paper is one of two by Lakhani that makes him the crucial boundary spanner between OI and UI in the first decade of the 21st century). The other paper is newer and somewhat less known: an under-appreciated O’Mahony and Lakhani (2011) chapter in Research on the Sociology of Organizations. Today, this is the best published discussion I’ve seen on firms and communities, although in the future I hope to add additional work alongside this. 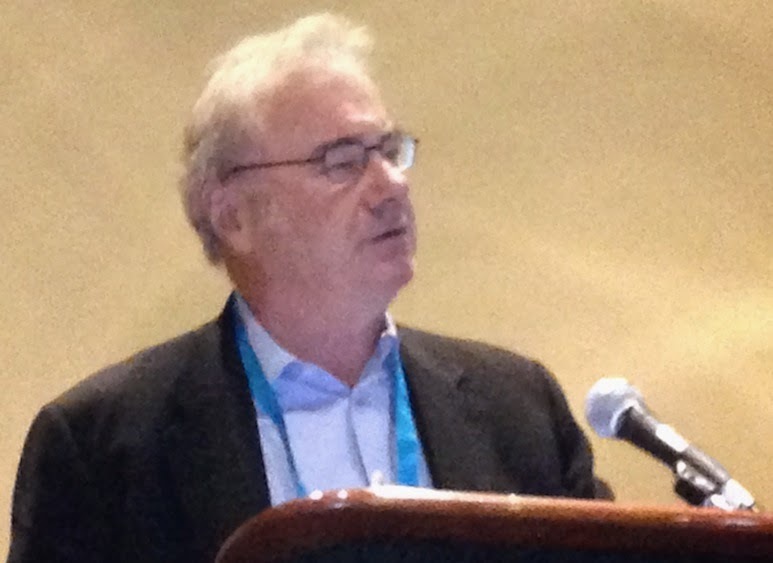 Perhaps the highlight — certainly the greatest honor — of the two weeks came as a discussant for an AOM panel on innovation ecosystems by Luigi Marengo (frequent co-author of Giovanni Dosi), Ray Miles, Chuck Snow (of Miles-Snow fame) and David Teece. These people didn’t know who I was, so I was honored by that the organizer (Sohyeong Kim of UC Berkeley) was willing to consider me as a discussant. Since I wasn’t going to tell these senior scholars how to improve their work, instead I tried to link the papers together and offer the more junior scholars (i.e. all of us) some ideas of how to extend this work. For the latter, the suggested extensions to their respective work is included in the slide deck, which I have posted to SlideShare. 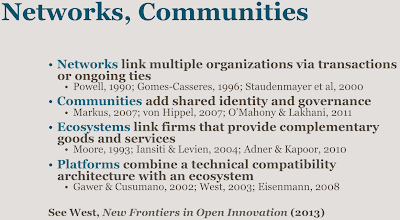 Networks, communities, ecosystems and platforms are increasingly important to technology-based firms, in understanding inter-organizatonal collaboration, in explaining differences in firm outcomes and of course for the study of open innovation. The cumulative process of open science requires that we use terms consistently to mean the same constructs with the same definitions. Physicists agree on a common definition of gravitational, magnetic and bosonic fields or the whole field (so to speak) would come apart. So while any concept (e.g. network, platform) can be refined, extended or limited, the terminology should be used consistently. A platform is not the same as a two-sided market or an ecosystem, even though it may have similar attributes to both. Given my interest (and expertise) here, I’ll probably blog disproportionately on this going forward. C’est la vie. Bresnahan, Timothy F., and Shane Greenstein. "Technological competition and the structure of the computer industry." Journal of Industrial Economics 47, 1 (1999): 1-40. Dahlander, Linus, Lars Frederiksen, and Francesco Rullani. 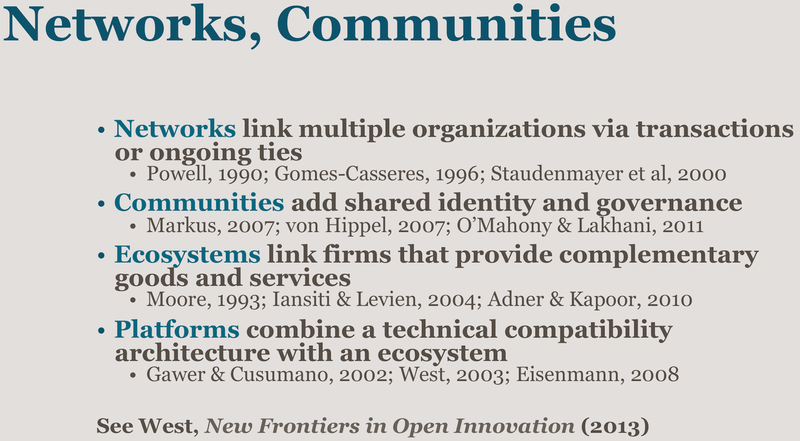 "Online communities and open innovation." Industry and Innovation 15, 2 (2008): 115-123. Gawer, Annabelle, and Michael A. Cusumano. Platform Leadership. Harvard Business School Press, Boston (2002). O'Mahony, Siobhan, and Karim R. Lakhani. "Organizations in the shadow of communities." Research in the Sociology of Organizations, 33 (2011): 3-36. Raasch, Christina, Cornelius Herstatt, and Kerstin Balka. "On the open design of tangible goods." R&D Management 39, 4 (2009): 382-393. West, Joel, “Challenges of Funding Open Innovation Platforms: Lessons from Symbian Ltd.,” Chapter 4 in Henry Chesbrough, Wim Vanhaverbeke and Joel West, eds., New Frontiers in Open Innovation, Oxford: Oxford University Press, 2014, pp. 71-93. West, Joel, and Karim R. Lakhani. "Getting clear about communities in open innovation." Industry and Innovation 15, 2 (2008): 223-231. The 2014 "Open and User Innovation Conference" is over and Academy is about to begin. Before I get two immersed in AOM, let me offer a few belated insights about #OUI2014 and why it remains relevant — and (I argue) central — for OI and UI scholars. By many measures, today OUI is the world’s best innovation conference. It offers some lessons about the current state of user innovation research, its overlap with open innovation research and also for how future open innovation conferences (such as WOIC 2014) should be run. Karim Lakhani summarizing OUI 2014 submission topics on Day One of the conference. The format, participants and topics have made the OUI conference the most relevant in the world for the study of innovation outside the firm. That’s why I’ve attended 7 conferences in a row — out of 12 total since the beginning. Academy is optional, UOI is mandatory. First, the size (200 participants) and length (2.5 days) is ideal for meeting and getting to know innovation scholars. Yes, there are a thousand or so innovation scholars at AOM, but try finding them among the 10,000 people here. I know if someone is at UOI, I will have time to talk to them and hear their work. This year was the first with a new format — a few plenaries by leaders of the tribe, followed by two parallel tracks for the rest of the day. I think the format worked well because there were few (but some) conflicts between sessions while still providing a venue for 122 papers. The one format change I’d make is with posters. When posters work well, they can make a difference in the career of a junior scholar, and also more senior scholars developing a new research interest. We had great luck with posters at the 2012 London conference. On Saturday, the OCIS division of the Academy had a great poster session with properly aligned incentives: if you want a drink, you had to talk to a doctoral student presenting his/her poster. I am hoping that posters will be a highlight of the WOIC 2014 if we can figure out how to fit them into the format. Right now, at OUI the “posters” are just a 2 minute oral ad for work that is otherwise not presented at OUI. It tells you what someone is doing but doesn’t give a chance to discuss it with them. In some ways, these seems like the least democratic aspect of a relatively democraticconference. I’d try to see if there’s some way for people to present their posters (e.g. at lunch or over drinks): if the experiment doesn't work, it can be dropped. At my first OUI (then UOI, before that UI) conference in 2008, I was surprised to hear German conversations along the banks of the Charles River as we took a break from the MIT sessions. Even today, German is the main language for 40-60% of the attendees — less in the US (which tend to draw more Americans) and (natürlich) more in Europe. The venues have reflected this German-focused aspect of the conference and UI research (and now OI research) more broadly. Of the first 10 conferences, four were at MIT or Harvard, three were in Germany (Munich, Munich, Hamburg), two in Austria (at WU Wien) and one in Copenhagen. Since 2008, the conference has formally alternated between Harvard Business School and Europe. While registration is now $200, I estimate that it costs $300-500 per person to run the conference, even with donated meeting space. The money mostly goes to food, but also can go (as in Brighton and Vienna) to renting outside venues, local transportation or pay for staff. It is no exaggeration to say that OUI is kept alive through the wealth of Harvard Business School and its generous subsidies of the conference in even numbered years. European organizers (such as Lisbon in 2015) have to find a grant or sponsor one time every 10 years or so, while the HBS endowment pays out $20k? $40k? (I don’t have the numbers) every two years to help catalyze a discussion of the work of von Hippel, Baldwin, Lakhani and others. OUI has historically been a good place for work on innovation communities. In my work on innovation communities with Jonathan Sims, we’ve seen that a large proportion of the work on external innovation communities is by user innovation scholars, people like Franke, Hienerth, Lettl and of course von Hippel. Open source was very prominent early on, although more recently it’s been reduced to one (relatively small) session. This OUI was taken over by a particular form of community, the crowd. Four of the 16 sessions were about crowdsourcing (a fifth on crowdfunding), making this the major theme of the conference — by far the most popular in terms of submissions. (The next closest was firm interactions with users, with 2 sessions). In his Monday plenary, Karim Lakhani bifurcated the crowdsourcing world into contests (competitive) and communities (collaborative). I look forward to seeing Karim (or someone else) explain the nuances in more detail. I agree that a contest is not a community, but (like all such classifications) the distinction will be one of degree and perhaps multidimensional. As I’ve noted many times before — in this blog and in my published research — there is a lot of overlap between open innovation and user innovation. Perhaps 75% of the studies at OUI would fit at WOIC, if the author explained how they built upon and contributed to the OI literature. But often the two tribes don’t talk to each other. As representatives of these respective tribes, Frank Piller and I have been trying to bridge these gaps. We have a chapter in the next OI book, and Frank used his Tuesday keynote to talk about the similarities and differences. At dinner I talked to a veteran UI scholar and we compared our respective thoughts. We agreed there is an overlap of subject matter, and so the main difference is on outcomes: UI cares about user success and OI cares about firm success. This impacts what we study, what we measure and of course the normative implications that we draw. (It also correlates to the sort of people and motivations that do the research). Studies of patent licensing are never going to be popular at OUI, while (I suspect) they will be common at WOIC. But open source, innovation communities, co-creation and — most of all, crowdsourcing — really belong at both. If crowdsourcing is about firms solving problems using the crowd, then at its core it’s an open innovation question — and so most of the 26 crowdsourcing papers and posters would feel right at home at WOIC. As such, I hope that we will continue to see an overlap of the audiences and authors between these two streams, and that the tribe intermingle (and beget shared papers) to cements the ties between us. Meanwhile, our venue size means that the first WOIC will be smaller than today’s OUI. Where we’ll be in 10 years is anybody’s guess, but I hope we can emulate the intimate and interactive format that OUI has maintained throughout its lifespan. 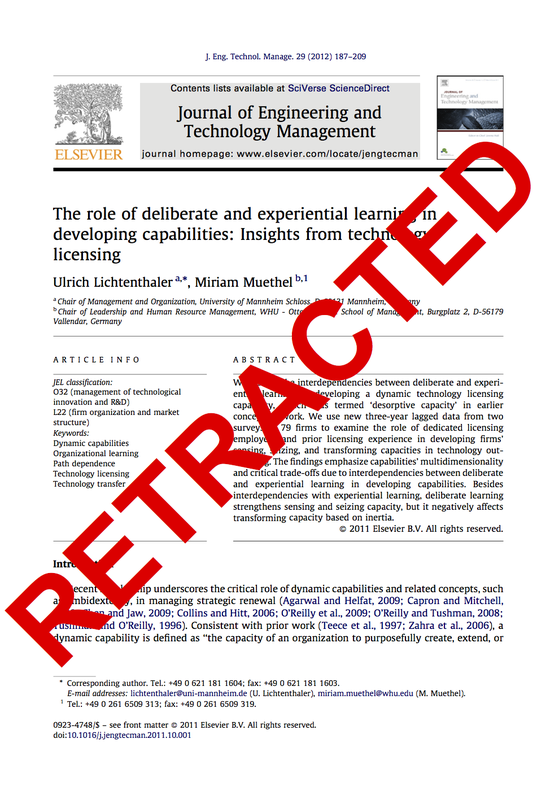 Just after posting the 14th and 15th retractions of Ulrich Lichtenthaler — in Entrepreneurship Theory & Practice — I received emails from two faithful readers pointing to his 16th retraction, in the Journal of Engineering and Technology Management (JET-M). As with one of the ETP articles, it was co-authored with Miriam Muethel, who overlapped at WHU with Dr. Lichtenthaler when they both completed their habilitation. This article has been retracted by agreement between the first author (Ulrich Lichtenthaler), and the Editor-in-Chief. The retraction has been agreed based on discussions about the presentation of the empirical results following an investigation conducted by the Journal. The second author was not involved in the empirical analyses. The first author assumes full responsibility. The editor in chief of JET-M is Jeremy Hall of Simon Fraser. The first retraction of any article by Dr. Lichtenthaler began in June 2012 with an article retracted by Strategic Organization. At the end of 2012, I summarized the first calendar year of retractions of Licthenthaler articles, when the retraction count stood at 8 articles. Of the subsequent 8 retractions, two came from LES studies and two came from papers that seemed to use the LES data but didn’t say so directly (as did the SMJ retraction). To avoid overlaps with earlier empirical studies (e.g., Lichtenthaler et al., 2010), we selected companies that are ranked on ranks 201–500 of the largest firms in terms of revenues in each of the following three industries: automotive, chemicals, and electronics. While 16 articles by Dr. Licthenthaler have been retracted, at least 35 have not — a considerable output. Six of the 35 articles are literature reviews. Seven of these articles are in journals that have already retracted at least one Lichtenthaler article — implying that these articles in their journal have been vetted and passed the test. I don’t have any information about the process at any of these six journals. Perhaps the two managerial journals (CMR and Sloan) are different, in that they aren’t about statistical tests, the managerial novelty of each article was vetted prior to publication, and that overlap with academic articles is a common and accepted practice. As for the four academic journals, I don’t know the status of their evaluation of the Lichtenthaler papers — or whether they are even doing an evaluation. From a strictly Bayesian standpoint, I think it unlikely that none of the 13 articles in these four journals demonstrate defects comparable to those of the 16 articles retracted thus far. Update Sunday 10:30am: According to a reader who studied the methods in more than 20 of the Licthenthaler papers, none of the four of the Technovation papers had problems similar to those of the retracted papers. Lichtenthaler, Ulrich (2012). "Technological Turbulence and the Impact of Exploration and Exploitation Within and Across Organizations on Product Development Performance," Entrepreneurship Theory and Practice, published online 5 June 2012, doi: 10.1111/j.1540-6520.2012.00520.x. (Retracted by the author, executive editor and publisher, June 2014).